A question of no less importance would also be about the truth of those religious experiences, phenomena, and revelations that a religious person could have. This question concerns the understanding of the existence of spiritual life and a conditional knowledge of the “other” world, because any mistake in this matter is always bound with great danger: he who does not enter into it by the door will be consigned to the lot of a thief and robber! (see Jn 10:1). Curiosity, fantasy, and insobriety in this realm, or attempts to penetrate the spiritual world by any means, are tantamount to suicide. It is well known, for example, that those who have actively been involved in spiritualism have as a rule ended their lives in suicide, or at least in total psychological disorder. All other forms of occultism bring a person to the same end. What is needed for the “discernment of spirits” according to the Orthodox teaching? Saint Ignatius (Brianchaninov) gives a thorough and precise answer to this question in his article, “A Word on Sensual and Spiritual Vision of Spirits.” We will note here the more essential thoughts in this article. The first spiritual vision is the vision of one’s own sins, which had been concealed before by forgetfulness and unknowing.… Seeing our inadequacies—this is a safe vision! Seeing our fall and redemption—this is a very needed vision.… All the saints considered themselves unworthy of God. By this they revealed their worthiness, which consists in humility. Only to the perfect Christian, most often to a monastic who is worthy to see with the eyes of his soul, has the world of spirits been revealed. But even during the very height of monasticism there were very few such people, as Saint Macarius the Great testifies. 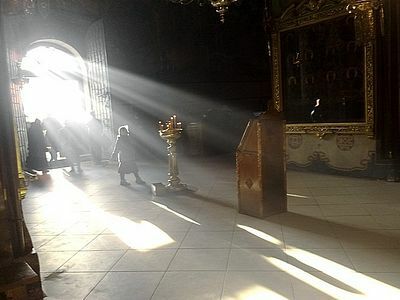 The quality of all visions sent by God, as Saint John Climacus notes, is that they bring humility and contrition to the soul, fill the soul with the fear of God, the awareness of one’s own sinfulness and nothingness. But visions which we try to grasp willfully, against God’s will, lead us to high-mindedness and conceit, and bring a joy which is nothing other than the satisfaction of our ambition and vanity, though we may not understand this. The very nature of revelations also says much about whether or not they are true. If man before the fall was able to see spirits directly and commune with them, then in his present state he can see them only by God’s particular design, and in times of extreme need, with the purpose of reforming and saving him. Therefore, all the holy fathers and ascetics who were experienced in spiritual life decisively warn the Christian about the possibility of falling into what is called prelest—that is, spiritual self-delusion, in which a person accepts his own neuro-psychological and often demonic stimulation and the false visions coming from it as divine revelation. Christian ascetical instructors command us generally not to pay attention to any phenomena that present themselves to our emotional and physical senses. They command us to observe a prudent coldness and saving caution towards all phenomena in general. The Holy Fathers command the ascetic of prayer to remain indifferent toward any phenomena that might occur within him or outside of him, and to pay no attention; he should consider himself unworthy of the vision of saints. They instruct on the one hand not to judge visions, so as not to judge a saint, but on the other hand never to believe in a vision or hastily accept it as true, in order to avoid falling into the snares of an evil spirit. In our times, when false mysticism and all manner of “miracles” are spreading in broad waves across all countries of the world (in the U.S., for example, nearly seventy percent of the population claim to have had an experience of extra sensory perception, and forty-two percent have communicated with the dead), it is especially important to remember these patristic warnings. What we seek with observation—I mean lofty Divine gifts—is not approved by the Church of God; and those who have received them acquired pride and falls for themselves. This is not an indication of a person’s love for God, but rather of emotional illness. All self-deceived people considered themselves worthy of God; by this they displayed their pride of soul and demonic delusion. Some of them accepted demons who appeared to them as angels and talked with them; to others the demons appeared in their own visage and pretended to be conquered by the ascetic’s prayer, and thus led them to high-mindedness; others stimulated their imaginations, heated their blood, produced a movement of their nerves, and accepted all this as grace-filled sweetness, falling into self-delusion, into total mental darkness, and joined themselves to the outcast spirits by the nature of their own spirit. Clear examples of the “revelations” that come to a person when he is in a state of spiritual delusion are illustrated by the Roman Catholic mystics. The state of prelest is characterized by fanaticism and superior airs. According to Saints Ignatius (Brianchaninov), Theophan the Recluse, and the Optina Elders, the famous book by Thomas à Kempis (fifteenth century) and much other Catholic, Protestant, and, of course, sectarian literature was written in states of prelest. The reason for such an assessment becomes clear by the following examples. Please note that these examples are not presented with the intention of offending the sensibilities of devout Catholics, but rather to show the sharp contrast between these saints’ spiritual moods and practices and those of the Orthodox ascetics and saints. It is tragic that such practices are promoted as models for emulation, thereby leading a devout flock into dangerous spiritual delusion, and shutting the door against true Christian humility, sobriety, and repentance. Although other aspects of these people’s lives may be worthy of admiration, the dangerous lack of mistrust for spiritual phenomena is something any serious Christian must avoid. Saint Francis of Assisi (†1226), one of the most well-known Catholic saints, prayed very long “about two mercies.” “The first is that I might … experience all the sufferings that Thou, sweetest Jesus, experienced in Thy torturous passion. The second mercy … is that I might feel that unbounded love with which Thou, the Son of God, didst burn.” Such requests reflect subtle pride, for he is essentially asking to be made equal to Christ. During this prayer, Saint Francis “felt himself completely become Jesus,” Whom he immediately saw in the form of a six-winged seraphim. After this vision, the traces of “Jesus’ sufferings,” painful, bleeding wounds (the stigmata) appeared on his hands. Of particular interest are the hysterical stigmata that at times develop in certain religious people who are exhausted by unceasing prayer and an ascetical way of life. Under the influence of morbid self-suggestion, blood circulation can be disrupted in those parts of the body upon which they focus. A psychotherapist can evoke such phenomena through hypnotic suggestion. Local inflammatory and vascular disruption during the patient’s hysterical neurosis can occur even during healthy periods. It is a known fact that on the hands, feet, and head of religiously ecstatic people who vividly experienced Christ’s execution in their imaginations, bloody wounds have appeared. There is really nothing of grace in stigmata, for this sort of compassion toward Christ does not contain that true love, the essence of which the Lord related plainly: He that hath my commandments, and keepeth them, he it is that loveth me (Jn 14:21). Therefore, substituting dreamy experiences of “compassion” for the struggle with the “old man” is one of the most serious mistakes in spiritual life, a mistake which has led and still leads many ascetics to conceit and pride, to obvious delusion, often bound up with clear psychological disturbance. Sisoes’ deep understanding of his own imperfection is the main outstanding trait of all true saints and is the most important sign that their revelations where true. Here are some excerpts from The Revelations of Blessed Angela (Moscow, 1918), also a Catholic saint (†1309). “‘My daughter, my sweet one … I love you very much,’ the ‘Holy Spirit’ said to her” (p. 95). “I was with the Apostles, and they saw Me with their physical eyes, but did not feel Me as you do” (p. 96). “And Angela herself revealed, ‘I saw the Holy Trinity in the darkness, and it seems to me that I am standing in its midst’” p. 117). She expresses her relationship to Jesus Christ, for example, in the following words, “From His sweetness, and from my sorrow at his departure, I screamed and wanted to die” (p. 101). When this happened, she would begin to beat herself with such rage that the nuns often had to carry her out of the church (p. 83). Or, “I could bring my whole self into Jesus Christ” (p. 176). Yet another illustration of Catholicism’s total loss of patristic criteria in understanding spiritual life are the revelations of Theresa of Lisieux, who died at the age of 23, chronologically the last of Catholicism’s higher saints. In 1997, in connection with the one hundredth anniversary of her death, by “infallible” decision of Pope John Paul II she was proclaimed a Doctor [in Russian, “teacher”] of the Universal Church(!). Just what she is teaching the Church can be read in her autobiography, The Story of a Soul. Here are a few quotes from this autobiography. “During a conversation before my tonsure, I gave a report of the activities I intend to undertake in Carmel. ‘I came to save souls, and first of all, to pray for priests.’” She did not come to save herself in the monastery, but others. The patristic understanding is that a person leaves the world for a monastery in order to repent of his or her own sins. Here is the love which Theresa lived and teaches her Church: “This was the kiss of love. I felt beloved and said, ‘I love You and entrust myself to You forever.’ There was neither forgiveness, nor struggle, nor sacrifice; already, long ago, Jesus and little, poor Theresa looked at each other and understood everything.… This day brought not an exchange of views, but a mingling, when there are no longer two; and Theresa disappeared like a drop of water lost in the depths of the ocean.” The love she is experiencing here is a purely sensual, dreamy sort of love, and not spiritual love as it is taught by the Holy Fathers. 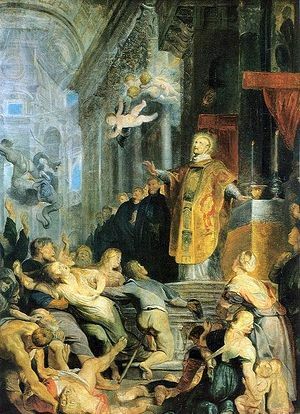 The methodical development of imagination is based in the experience of one of the pillars of Catholic mysticism, the founder of the order of Jesuits and great Catholic saint Ignatius of Loyola (sixteenth century). His book Spiritual Exercises enjoys great authority in Catholicism. Ignatius himself said of his book that if one reads it, it could replace the Gospels.He tells the reader to imagine the crucified Christ, to attempt to penetrate the world of Christ’s feelings and sufferings, to mentally converse with the Crucified One, etc. All this contradicts in principle the basics of spiritual ascetic labor as it has been given to us in the lives of the saints of the Universal Church. Ignatius’s methods lead to complete spiritual and often emotional disturbance in the practitioner, and from that point, to whatever “revelations.” Here are a few examples from Spiritual Exercises. The authoritative collection of ascetical writings of the ancient Church, the Philokalia, categorically forbids any sort of “spiritual exercises” that are bound up with imagination or conversations with crucified Jesus. Here are a few quotes from this collection. 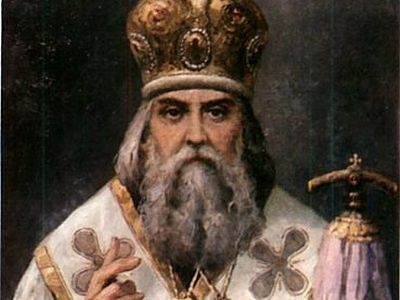 Saint Neilos of Sinai (fifth century) warns, “Do not desire to see with sensory eyes the Angels or Powers, or Christ, so as not to lose your mind, having accepted a wolf as the pastor, and bowed down to your enemies, the demons. The examples presented here show that breaking the laws of spiritual life inevitably brings a deep distortion of a person’s consciousness and feelings (the heart). That person comes into contact with the world of fallen spirits, the spirits of lies and delusion. This leads to false visions, false revelations, and prelest. Since no one is immune to spiritual blindness and concealed pride, the unchanging and firm law of the Church is do not accept any revelations, but continually abide in repentance and humility. Reading and even simply being in the presence of occult literature, such as that of E. Blavatsky, A. Besant, N. Roerich, R. Steiner, and E. Shure, has an extremely negative effect upon a person’s psyche. Nowadays a great deal of such literature is being printed. See for example “On False Teachings…” Journal of the Moscow Patriarchate 6 (1992). These are two relatively recent movements in Russia, typical totalitarian sects, which have been the cause of much physical and mental illness amongst their adherents. —Trans. Saint Isaac the Syrian, Ascetical Homilies (Moscow, 1858), 74:530. Saint Ignatius, Collection of Letters (Moscow, Saint Petersburg, 1995), letter 290. Saint Isaac the Syrian, Ascetical Homilies, 55:372. For a characterization of Catholic mystics, see Priest Paul Florensky’s Pillar and Ground of Truth, example 400. M. V. Lodyzhensky, Unseen Light (Petrograd, 1915), 109. A. A. Kirpichenko, Psychiatry (Minsk: The Highest School, 1989). Saint Francis of Assisi, Writings (Moscow: Franciscan Publications, 1995), 145. A. F. Losev, Ancient Symbolism and Mythology (Moscow, 1930), 1:867–868. D. S. Merezhkovsky, Spanish Mystics (Brussels, 1988), 88. Orthodox tradition has it that demons whistle. Christ does not whistle. —Trans. It must be noted, that although the term “bride of Christ” is often used in connection with women’s monasticism in the Orthodox Church, the use of the word “bride” and “Bridegroom” is also used in reference to Christ’s union with the Christian soul, and with the Church. Note, however, that the word “spouse” is not used in this connection. A spouse is a husband or a wife, united carnally, whereas a “bride,” or “bridegroom” is one betrothed, united sacramentally, and not carnally. —Trans. William James, The Varieties of Religious Experience (Russian translation from English) (Moscow, 1910), 337. This refers to the Catholic dogma of Papal infallibility. —Trans. “The Story of a Soul,” Symbol 36 (Paris, 1996): 151. A. A. Bykov, Ignatius Loyola, His Life and Social Activity (Saint Petersburg, 1890), 28. Saint Neilos of Sinai, “153 Chapters on Prayer,” The Philokalia, Vol. 5:2, Chap. 115 (Moscow, 1884), 237. Saint Symeon the New Theologian, “On the Three Examples of Prayer,” The Philokalia 5 (Moscow 1900), 463–464. Saint Gregory the Sinaite, “Instructions to Hesychasts,” Ibid., 224. Why is it that I turned to his works in particular? As is well known, the oral and written accounts of him by all the Optina Elders and many other pious Russian ascetics are not simply positive, but rather, I’d say, are filled with admiration. Why Are We Orthodox? 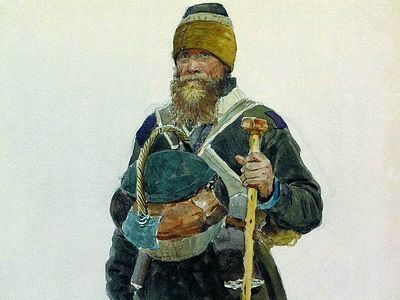 Alexei Ilyich Osipov Why Are We Orthodox? “What now can be more awful than these things? For in truth the Church was a heaven then, the Spirit governing all things, and moving each one of the rulers and making him inspired. But now we retain only the symbols of those gifts. For now also we speak two or three…But these are only signs and memorials of those things…when we begin to speak, the people respond, “with thy Spirit,” indicating that of old they thus used to speak, not of their own wisdom, but moved by the Spirit. But not so now: (I speak of my own case so far). But the present Church is like a woman who has fallen from her former prosperous days,…bereft of her wealth.” (Homily 36, chap. 7, 1 Corinthians). Was Paul a purveyor of “emotional illness”? Thomas Patrick: Just because His All-Holiness Patriarch Bartholemew can often be seen fraternally kissing the pope in media photos does not change the very basic Orthodox Christian teaching on prelest, or spiritual delusion. Our patriarchs do not claim infallibility, and they cannot change our accepted teachings from those of the holy fathers of the Church. And spiritual delusion is not a joke, but a very serious spiritual and psychological disorder. Peace be to you. Thomas Patrick: As a Catholic, you are not likely to have been exposed to this patristic Christian teaching, but for the Orthodox it just the basics. Prelest--spiritual delusion--is not a joke, but a very serious spiritual illness. "Believe not every spirit, but test the spirits, to see whether they are from God" (1 John 4:1). i laugh at this ha ha...in all humility. I have sarcastice wit... i am a devote catholic who is very sad and disappointed in your opinions of prelast...especial since i admirer and love the orthodox and eastern rite catholics. would the eccumenical patriarch bartholamew share your ideas???? i have read both catholic and orthodox writtings mentioned and fined very similar ideas which have lead me closer to the lord jesus christ. your words are a crucifiction for me and i weep. god bless a roman catholic. thomas patrick mccormick. Those who have been in the grip of prelest, and by the mercy of God were guided back towards sobriety, would be qualified to say which is right: "By their fruits ye shall know them." There's a huge difference between Christian agape and sentimentalism. Likewise, there is a world of difference between the humble sobriety of St. Macarius and the kind of imaginative self-indulgence of "visionaries" described by the author of this article. Interesting contrast between eastern and western spirituality. Who's to really say which one is right though? This is a very important article in a time when genuine life in Christ is rarely differentiated from false spiritual experiences and delusion.